Build the skills and knowledge to gain total control of your money and secure your financial future. 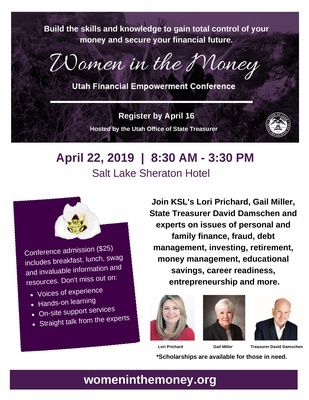 Join KSL's Lori Prichard, Gail Miller, State Treasurer David Damschen and experts on issues of personal and family finance, fraud, debt management, investing, retirement, money management, educational savings, career readiness, entrepreneurship and more. includes breakfast, lunch, swag and invaluable information and resources.